Support Microfinance Bittiya Sanstha (Support) Ltd. is registered under the "Company Act 2063" with the Company Registrar's Office of Nepal as a Microfinance Institution on Nov 14, 2014 (2071.07.27 Bikram Era). 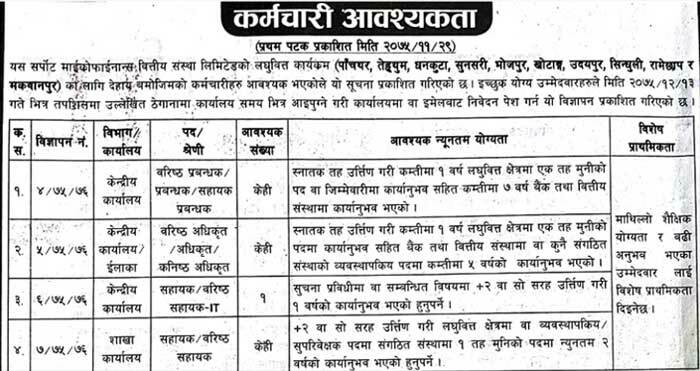 Support Received Operating License from Nepal Rastra Bank on June 30, 2015 and Started Formal Microfinance Programs from July 12, 2015 (2072.03.27) under Bank and Financial Institution Act 2063(2006). view original vacancy below for more details and application procedure.